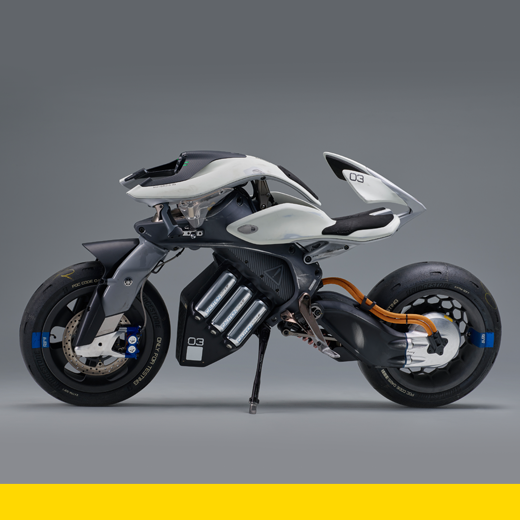 MOTOROiD is a proof-of-concept electric motorcycle prototype that employs AI and Yamaha-exclusive technologies aimed at creating an entirely new personal mobility experience. This project examined avenues for enriching the rider-machine relationship and two-wheeled mobility in the future while keeping human operation central. MOTOROiD employs a dual-lens camera to recognize its owner and sense their biometrics, gestures and movements, enabling it to interact with the rider like a living creature. Autonomously and unassisted, it is capable of standing up or setting down on its kickstand, standing still while upright and moving at slow speeds. MOTOROiD is also equipped with simple, intuitive handlebar controls and with haptic feedback surfaces that envelop the rider to foster a greater sense of unity with the machine . The exterior was left devoid of pomp and polish on purpose to visually capture the process of innovation and the failures involved. Designed by: Teppei Maezono, Norihiko Kamiya, Natsuki Kono, Kinji Asamura and Masaya Kawashima of Yamaha Motor Co., Ltd.